Whether you're getting up before dawn to hike up mountains for that one special sunrise shot, or commuting with your camera in tow, every photographer needs to keep their kit safe and protected, and from backpacks and daysacks to holsters and rollers, photographers can now carry their kit, accessories (and even some lunch) in all kinds of luggage. Most of bags featured here are for DSLR or mirrorless cameras, whose interchangeable lenses, demand some thought when you're mobile. Most also now find room for a laptop – as big as 17-inches in some cases – or at least a tablet; with post-processing so integral to digital photography, who wants to wait until they get home to see how a photoshoot turned out? Though it might seem pretty pricey, the Everyday Messenger is bristling with clever touches and is well worth the outlay. A spring-loaded flap-catch with four fastening points is both secure yet easy to use, letting the bag expand or contract to suit varying loads. The flap also has a zippered top passthrough for even easier access. There are slots for a 13-inch laptop and tablet, plus you can attach a tripod on top. Rather than using typical foam partitions, the main section contains innovative dividers that snap around and over individual items. Everything’s supported by a wide and supple shoulder strap, and we also like the stabilizing waist strap that prevents the bag bouncing as you stride. Beautiful build quality and attention to detail seals the deal. It’s tough to create a truly special camera backpack, as competition in this area is particularly fierce, but Gitzo has come up with a real winner in the Adventury 30L. Designed to accommodate a pro DSLR (including a Canon EOS-1D X Mark II or Nikon D5) with a 70-200mm f/4 lens attached, plus a second body and up to four more lenses. Alternatively, you can pack a 400mm f/4, a camera body and a couple of lenses or small accessories. There's also space for a 15-inch laptop as well. As you'd expect for a Gitzo product, the quality is excellent, with great internal padding, while the bag itself is made from weather-resistant materials, with coated zippers and bottom section. Should conditions get really bad there's also a rain cover, while the color of the materials used is designed to help the bag blend in when you're outdoors. This backpack zips up a 13-inch laptop and a tablet in a front pocket, while the main compartment for camera gear is accessed under a padded, zipped lid on the back-facing side. It fits one DSLR body and three lenses, including a 70-200mm, and there are some useful design flourishes – as well as a roomy top section for accessories (and perhaps even a packed lunch), there’s a pull-out rain cover in the base, and an expandable tripod pocket. It's also sized to house a DJI Mavic Pro drone. This pocket-packed shoulder bag somehow manages to squeeze in both an 11-inch laptop and a tablet, as well as camera gear, while the padded kit compartment flat-packs when empty. Inside, three snap-shut pouches spring open to grip a compact mirrorless camera or DSLR (though it's best for smaller entry-level models). It’s probably not rugged enough for landscape photographers, but it does well around the city – and it makes for a great carry-on bag for flights. It's even got a pass-through for a telescopic handle, so it can piggy-back on rolling luggage at airports. It's luxury choice for sure, but this retro-styled waxed canvas-and-buckles backpack is both outdoorsy tough, and has an incredible capacity for holding – and disguising – a lot of camera gear. The main compartment can store a DSLR with a 70-200mm lens attached, itself a rarity, but has room for six or seven additional lenses if the moveable dividers are carefully placed. There’s even space for a 17-inch laptop, it has a leather undercarriage for setting it down outside. However, with all that kit plus 2kg of canvas, The Camps Bay could get pretty heavy. If you're going to be travelling a lot with you're camera, then the Hexad Access Duffel is the answer. Featuring a clamshell, one half of the bag can be set aside for clothes and other travel essentials, while the other half for photo gear, with dual side-access pockets. These can accommodate Wandrd's medium camera cubes (sold separately) which offer protection for your kit. If you just want to use one, you've get even more space for day to day stuff. There's also a padded laptop sleeve, stowable backpack straps and a handy expandable laundry pocket. Then there's the weather-sealed materials used, while the overall finish is excellent. Perfect if you're going to be on a city break and want to travel light. Ideal for professional photographers or anyone flying off on a landscape photography expedition, a safari or or even just storing your kit when it's not in use, you won't find a better solution than the Peli 1510 Protector Case. It's not just the protection it provides that makes it a great buy – the ease with which you can organize and access your camera kit on location makes it incredibly useful. It's a little heavy and bulky, but it's worth it for the protection it provides. 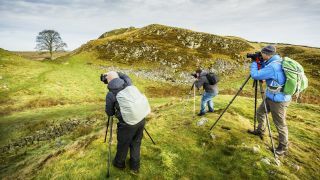 Despite there being some great backpack out there, no-one has yet produced a decent curved-back backpack for high-grade hiking that also stores a DSLR. The Kontrast doesn’t quite fill that niche, but it does act as a stop-gap – large enough to take a reasonably big lens (a 105mm fits fine), it can be stuffed into a backpack or slung over a shoulder while out on the trail. Inside there’s a ‘hammock system’ halfway down for cradling and securing the lens, while the sides also have pockets for accessories and memory cards. Solid and good value, the Kontrast impresses. Designed for compact mirrorless APS-C cameras like the Sony A6500 and Panasonic's Lumix G85/G80, this holster-style case makes good use of space. A camera fitted with an 18-50mm lens can fit inside the main compartment, while there’s a zip-around section attached to the bottom for another lens. It’s compact, sturdy and offers a lot of protection, but it's worth trying it out with your specific camera and lens to make sure it all fits neatly. As well as a shoulder strap and belt loops, the Holster XS Plus includes a few zipped pockets for SD cards and accessories. Looking more like traditional urban luggage than a camera bag, this bug-shaped backpack has a hard yet padded front lid that zips all around, and drops down for easy access. The dividers inside are easy to move and secure, and make it simple to configure for a DSLR and two to three lenses. If used in that configuration there's just a small zipped area for other items, but an UltraFlex divider can be used to make the bag half for camera gear and half for other stuff, making the Tahoe BP 150 handy for anything from street photography to a serious hike. There's also an organizer area in the lid with a tablet pouch, and a couple of mesh side pockets.